When foot-and-mouth disease swept through the British countryside in early 2001, more than 10 million sheep, cattle and pigs were slaughtered to control the disease. Despite the devastation, the disease was contained within 10 months, due in part to the availability of finely detailed farm data, which enabled mathematical modelers to make accurate predictions about the spread of the disease and suggest optimal ways of managing it. Should foot-and-mouth disease occur in the United States today where privacy laws restrict the accessibility of data, making predictions about the disease might not be so easy, according to a new study that weighs the costs of privacy in preventing disease outbreaks. Foot-and-mouth is one disease that livestock owners dread most. It spreads widely and rapidly, infecting cloven-hoofed animals such as cows, pigs, sheep and goats. Infected livestock have to be quarantined and are usually killed. The costs of an outbreak of foot-and-mouth in the United States could easily exceed $50 billion, which is why the U.S. Department of Homeland Security has labeled it as a threat to national security. 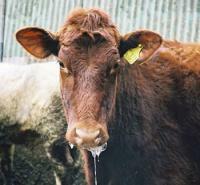 The last outbreak of foot-and-mouth disease in the United States occurred in 1929. The study, "Disease Prevention versus Data Privacy: Using Landcover Maps to Inform Spatial Epidemic Models," which appears in the journal PLOS Computational Biology, was authored by CHANS-Net member Sadie Ryan, of the State University of New York College of Environmental Science and Forestry, and Mike Tildesley, of the University of Warwick. The researchers used land cover maps to approximate the likely location of farms to improve the accuracy of mathematical models that could be used in making disease control predictions. Land cover maps, which aggregate data on habitats rather than providing information on individual farm locations, are the only kind of maps available in the United States where privacy laws protect precise locations of livestock farms in order to protect the anonymity of farmers. The mathematical models in the study showed that highly resolved land cover maps could act as an accurate predictor for farm locations and provide accurate advice regarding the optimal strategy to control disease spread. In the 2001 foot-and-mouth outbreak, the U.K. government approved the culling of not only animals on infected farms but also culling of animals on adjacent farms as they were considered at increased risk of infection. Thus, the precise location of farms is vital knowledge to making epidemiological predictions. While this study focused on the foot-and-mouth outbreak, the method could also be used for planning purposes in the event of a future outbreak of other infectious diseases in livestock. "The advantage of the current study is that it provides a framework for assessing the potential epidemic impact that might occur in environments that lack sufficient data," said Tildesley. "Having accurate epidemiological models can help policymakers explore a range of control measures beyond culling, such as vaccination, movement restrictions, and increased farm security."